We’re in Kansas City, which is experiencing slightly cooler-than-normal weather, visiting family and some friends and generally trying to unwind. The first several days of vacation have seen some of my attention turned towards work as a project needed to be wrapped up. Nothing too difficult, just some reading of documents. Since St. Patrick’s Day is coming up, we decided to prepare an Irish (Irish-ish?) dish: shepherd’s pie. We involved both the nieces, figuring that one is much more likely to eat new foods if one has been involved with preparing the foods. 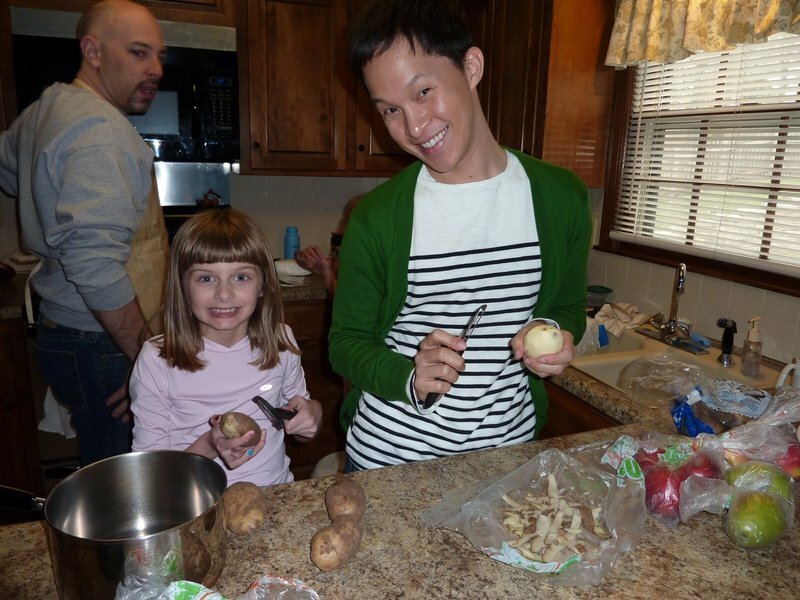 Emily and Tawn peeled and chopped potatoes, carrots, onions, and squash for the pie. 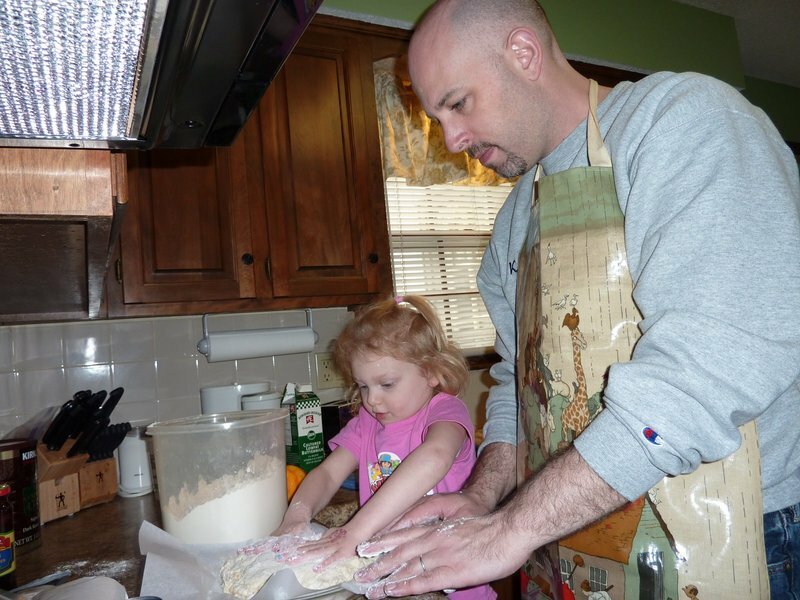 Ava assisted me in making a loaf of Irish soda bread, which had hints of orange zest in it and turned out very nicely. 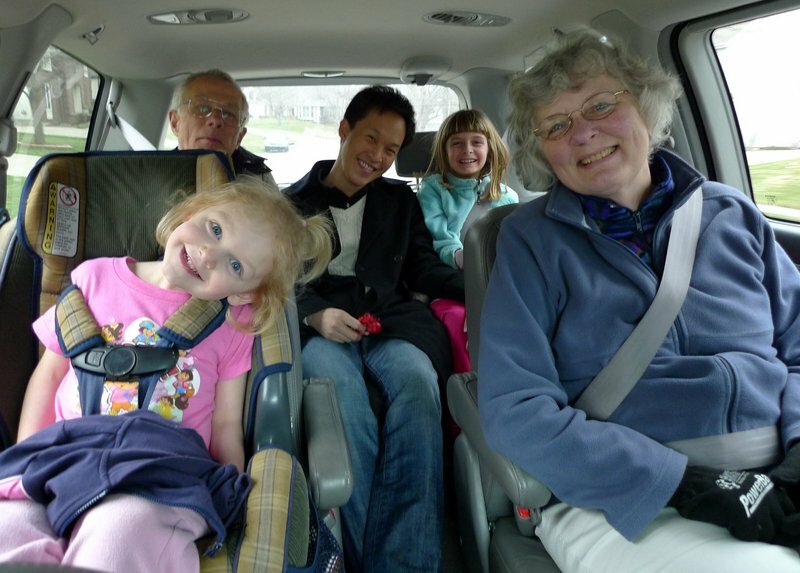 After preparing dinner we headed about 30 minutes outside Kansas City (towards Lawrence) to visit the Gasper Family Farm. A local, family-run sustainable farm that I’ve been following for about a year and a half, I wanted to bring the girls out to see a real farm and, while there, to purchase some cuts of pork, some fresh eggs, and whatever else was available. My parents decided to tag along for the ride. My father spent the first six years or so of his life living on a farm in central Missouri. 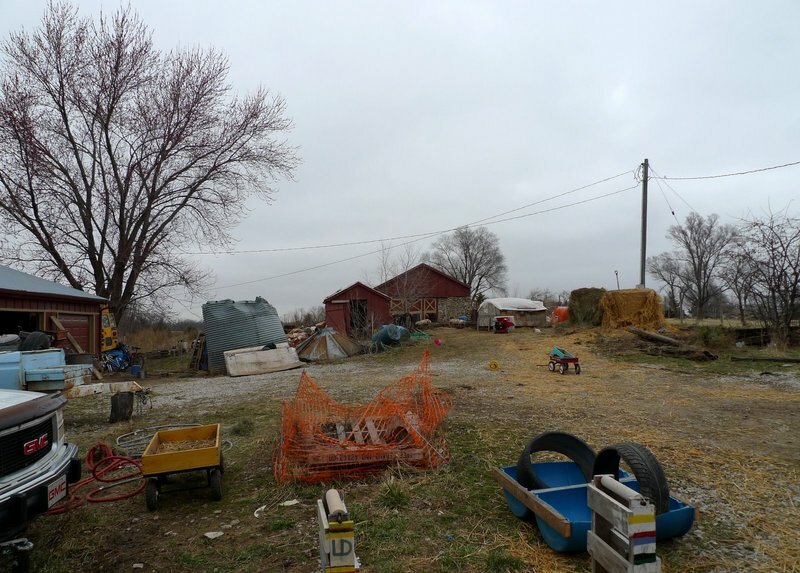 The farm is relatively simple – a house, a barn, and a few other small buildings. The cows are pastured a few miles away on rented land. There are pigs, geese, loads of chickens, and a horse that provides transportation. The slightly older chickens – these are raised for meat – that haven’t feathered out enough to be taken to pasture, so they are still living in one of the chicken coops. 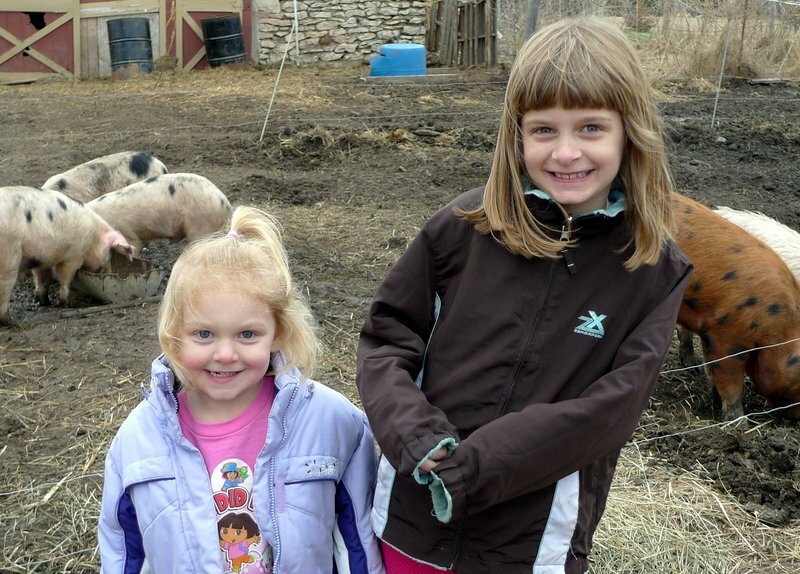 After a lot of coaxing, Ava and Emily agreed to pose by the pig pen. The animals were a little more “wild” than I think they expected, their previous farm experiences being limited only to petting zoos! 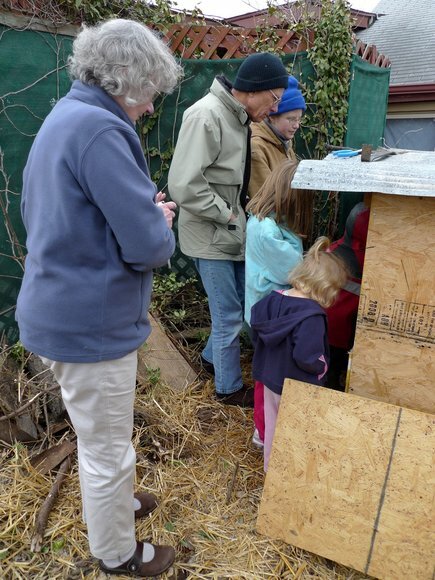 Everybody peering into the smaller chicken coop which contains the young chicks. They were running around, peeping, staying close to the warming lamps. It was chilly out on the farm and so after about twenty minutes we bundled back into the car with our sausage, pork chops, and two dozen eggs, and heading back to town. 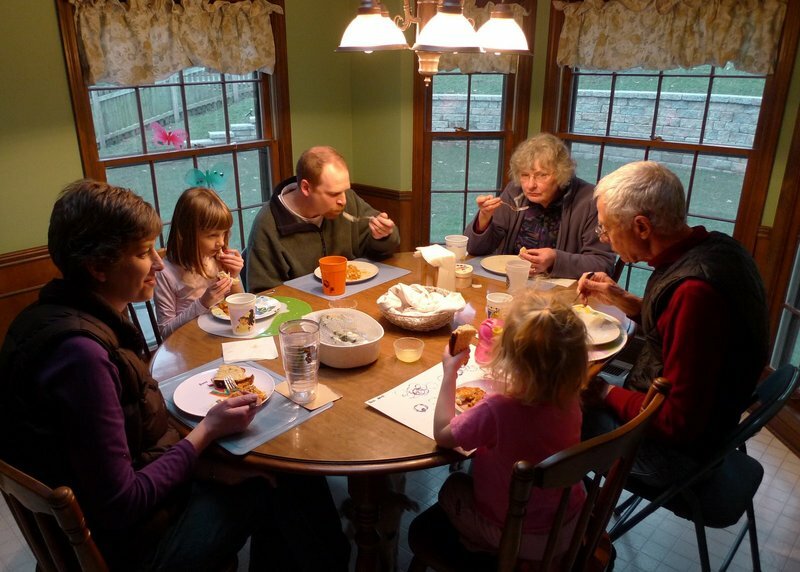 After the visit to the farm, everyone was ready for a hearty dinner of shepherd’s pie, soda bread, and steamed artichokes – a not very Irish addition to the menu. Tawn and I were scheduled to head out to dinner with a friend, so didn’t join this meal. Above, shepherd’s pie. We substituted pork for lamb and added some acorn squash for additional flavor. I did try a bite to make sure it turned out okay. For dinner, we headed to Houston’s, a chain that has knife and fork ribs that Tawn really likes. We met our friend Jack there, a Thai who has studied and worked in the Kansas City area for more than a decade. This was a good chance to put my new camera to the low-lighting test. I’m happy with the results, although I need to play around with the instruction guide and settings a bit to learn how to coax the most from the camera. 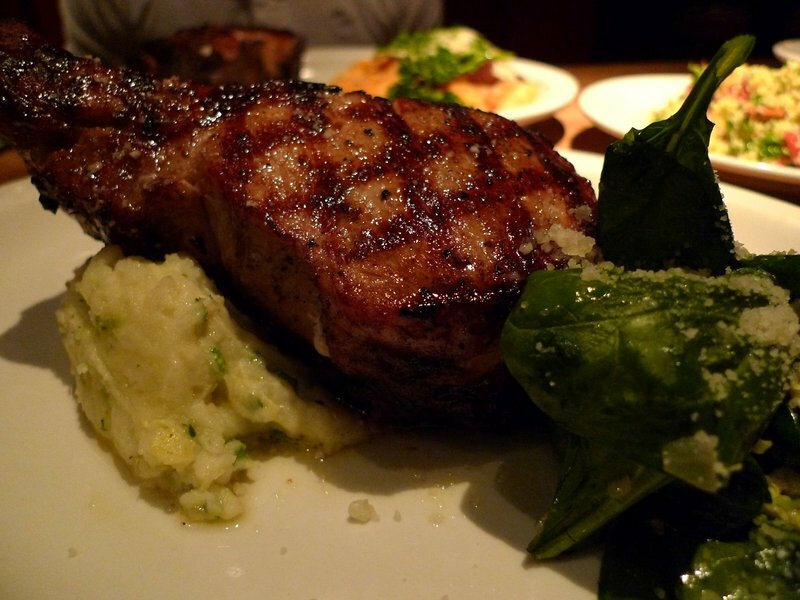 Double-cut grilled pork chops with mashed potatoes and spinach. 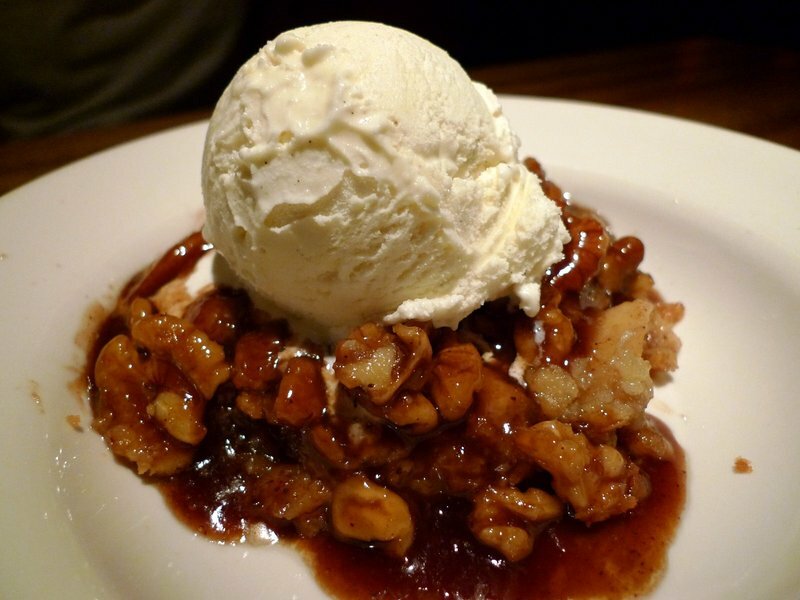 Apple and walnut cobbler with vanilla ice cream. This entry was posted in Uncategorized and tagged Chickens, cooking, Farm, food, Gasper Family Farm, Irish, Pigs by christao408. Bookmark the permalink. 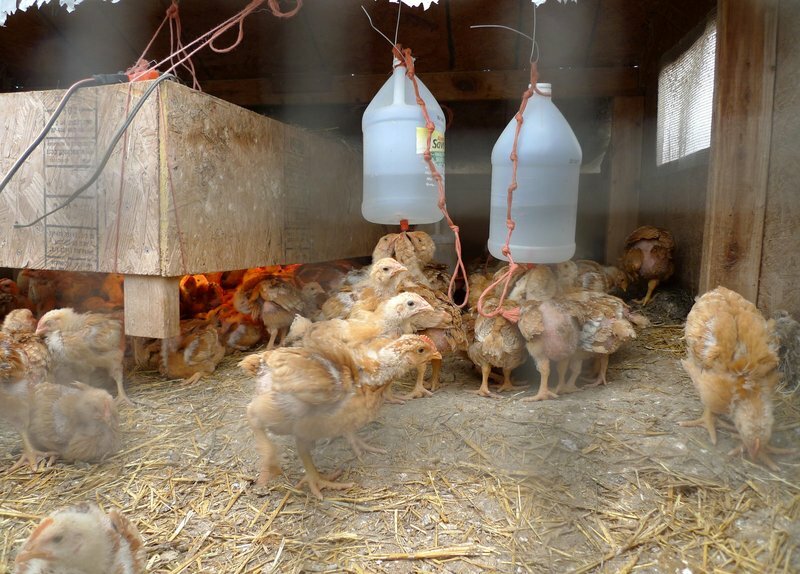 Is that a heat lamp above the little chickens? The food looks amazing! And nice photographs otherwise as well. Looks yummy! And what fun to take the girls to visit a farm. awwwww, so adorable! They look like fun kids. Farm pigs are actually pretty intimidating, lol… i was pretty surprised the first time. Not at all like petting zoos, as you said. The results look pretty good :)It seems wherever you go, I envy your travel experiences; whether they are in Thailand, Singapore, SF, or even to a farm outside of KC. For the last few years, even now, I still feel like that’s a life I could life; out in the midwest, maybe in Missouri, living a farmer’s life.I’ve never had Shepherd’s Pie before, much less have ever made it, can you believe that?Happy St. Patrick’s day! I love the picture of everybody peering into the coop!!! Little Ava looks so attentive and serious (even from the back) and has the same pose as your dad! Little kids are so cute when they’re serious! The pie looks very good and would probably go well with a Singha! I love the first picture.I’m glad the new camera is working out well. the ‘free-range’ chix pix looks pretty interesting…..
yum! i make shepherd’s pie every so often, and i love artichokes although i haven’t had them in a while — my mom gets them every year in the spring, but for some odd reason i can never find them on sale around here. i’ve never visited a farm, but my grandfather used to live on a pig farm. growing up, at one point he had a pet pig who followed him everywhere! Chris. . .I’m in KC. We should have done lunch! Oh, well, next time! We live in Brookside and LOVE it! Hope you do some shopping on the Plaza. . .oh and drinks at the Power and Light District. Some relatives on my Dad’s side had a farm in Arkansas City, KS. I loved going there in the summers with my cousin. It had a creek right behind it and we would catch crawdads. . .like two little tom boys! @Art4ArtSake – Brookside is a great neighborhood, isn’t it? It is the type of place I think I would live if I were back here. We were down on the plaza a bit the other day – always a nice place to visit. @kunhuo42 – A pet pig? Fun. It would blindly follow you into the slaughterhouse! (evil laugh…)@iskrak – Thanks. It used to be my mother’s apron (I wonder what apron she uses now?) and she gave it to my sister. @agmhkg – They look happy … and tasty! @ElusiveWords – Everything goes well with a Singha. =D@Senlin – That’s funny. I hadn’t noticed the same pose but now that you point it out, it is all I see. @arenadi – If you’re going to move to the Midwest, you had best try your hand at some shepherd’s pie! @CurryPuffy – The new camera is performing very nicely, yes. @secade – They are intimidating. @Wangium – Yep – they run closer to it and away from it depending on how cold they are. Self-regulating heat. @Dezinerdreams – @Shes_a_lady – Thanks@slmret – It was fun, until they got cold and scared of the pigs! @christao408 – At least they’ve now seen a pig — when I was about 12, we realized that I’d never seen a pig — we had to really go hunting to find one! Meant to say before — Shepherd’s Pie is one of my favorites, too — yum!!! Shepherdd’s pie looks very good. The dessert takes the cake! yum. Glad you are having fun with the family. 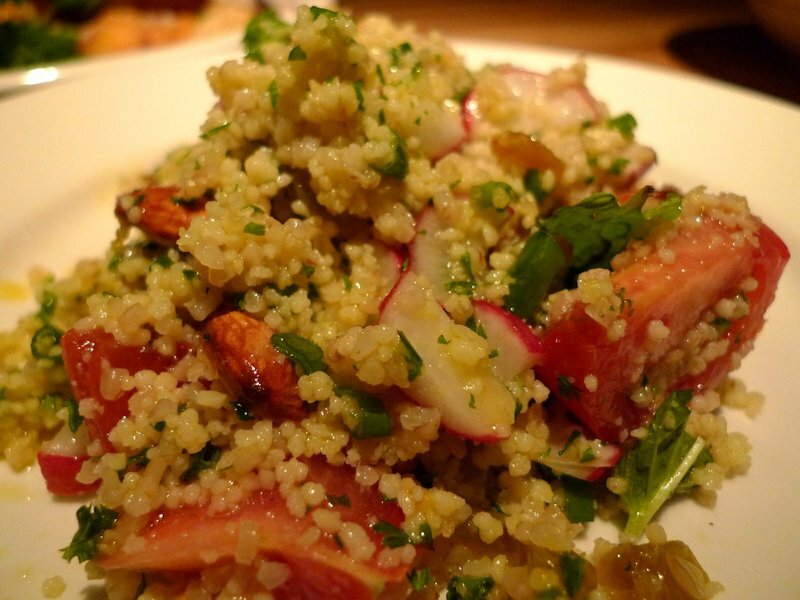 the grilled pork chop and cous cous salad lookin’ damn good to me right now. yum! 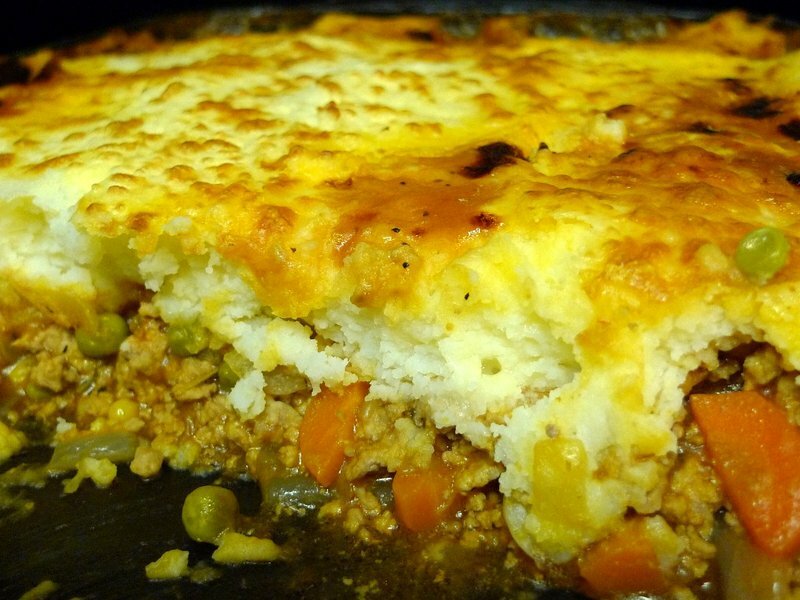 @slmret – @ZSA_MD – Shepherd’s Pie is really good. I should make it more often. @rudyhou – Houston’s is really good food, for a chain restaurant. Ooo, I’ve never tried making shepherd’s pie before. Your version looks delicious!